Sleep apnea is characterized by an intermittent stoppage of respiration that occurs during sleep. It is caused by the obstruction of the upper airways (obstructive apnea) or, more rarely, by the interruption of the contraction of the respiratory muscles. Obstructive sleep apnea particularly affects obese men over the age of 40. It is due to the combination of two factors: the normal relaxation of muscle tone in the throat during sleep and the reduction in the diameter of the pharynx caused by obesity or anomalies of the palate, the tonsils, the tongue, or the jaw. Obstructive sleep apnea and the lack of rest that accompanies it is manifested by various generally harmless symptoms: snoring, agitated sleep, frequent awakening during the night, sleepiness during the day, general fatigue, memory and attention problems, irritability, depression. Serious forms may cause complications such as respiratory insufficiency, cardiac arrhythmia, or hypertension. The consumption of alcohol or of certain sleeping pills before going to bed is an aggravating factor. Snoring is the sound generated during sleep by the vibration of the soft tissues of the throat and mouth. It occurs most often during inhalation and is caused by the obstruction of the passage of air through the nose (e.g., during a cold), or by the relaxation of the throat muscles during sleep. In the second case, it may be a symptom of sleep apnea. Snoring particularly affects sedentary men who are overweight. The consumption of alcohol before going to bed and the taking of sleeping pills aggravate it. 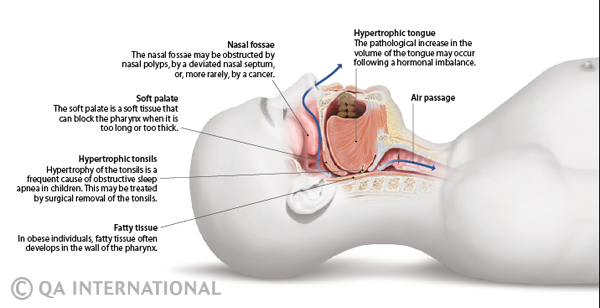 Sleep apnea treatments are based on surgical techniques (removal of soft tissue of the throat, nasal surgery) or assisted ventilation. The latter consist in blowing in pressurized air at the moment of inhalation and for the duration of the sleep using a pump placed near the bed and connected to a nasal mask. The treatments must be accompanied by a suppression of aggravating factors (obesity, alcohol, tobacco, sleeping pills). Respiratory infections: beware of complications!